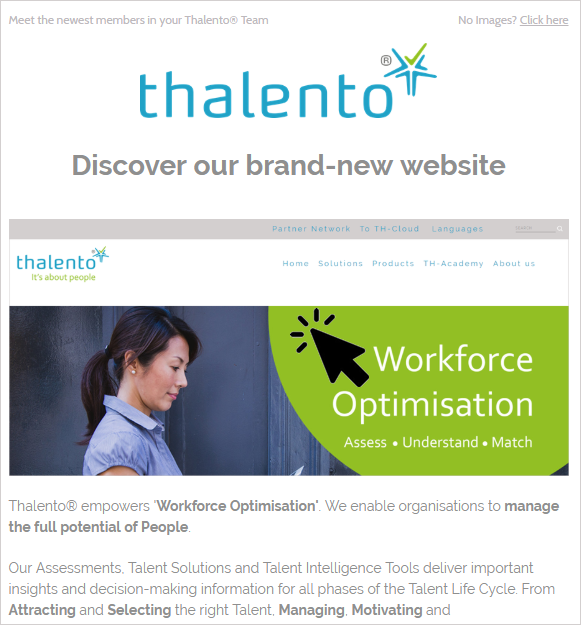 Discover our brand-new website on Workforce Optimisation. Learn more on how we enable you to manage the full potential of your People and upcoming features of the Thalento® website. The past months were hectic. Check out which national and international events we attended and find more information about our future Whereabouts in the event calendar. Training leads to perfection. We offer several Open Training Sessions & In-Company Trainings to help you mastering the interpretation of TH Profiles. Interested? Get in touch. Did you know that there is a wide range of ‘how-to’ videos available in the Thalento® Cloud? Find out more about them. Get to know Lore & Diandra, the newest members of the Thalento® Team. Watch their intro video. Click the image to read our November newsletter. have fun!